The Doran/Tennant adaptation goes outside for the first time for this scene, set in a corner off a church-like building. The gravediggers are dressed, absurdly, in suits and ties, despite the fact they are surrounded by heaps of mud. The First Clown is in the grave eating a sandwich and drinking his tea, while the Second stands off to the side with a yellow security vest and a clipboard. On the one hand, it presents these characters as middle class tradesmen; on the other, their choice of attire seems foolish, bordering on work-safe parody. 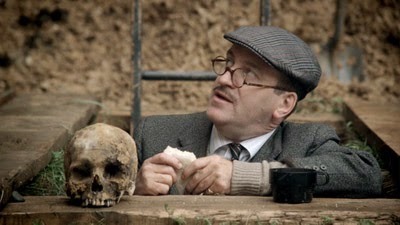 Though we don't get the gallows joke, the discussion on the sinfulness of suicide is retained, and the Gravedigger uses his food to demonstrate his ideas (man as sandwich, water as tea). In that sense, the overly formal attire makes him look like he could be a country lawyer. Having lost the argument, the Second Clown trudges off with a final rude gesture that makes the First laugh. Laughing is very much his thing, and it's obvious that as fools go, he's a voluntary one. No dimwit here, he knows his dumb answers are jokes and that he's playing with Hamlet. In most stagings of the play, the Prince stops at the grave, curious to see who is to be buried in it, and stays because of the fool's wit. 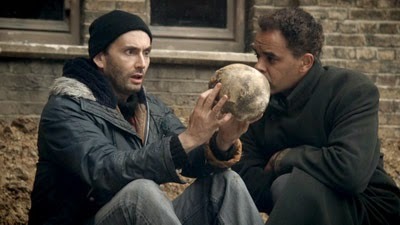 In this case, Hamlet might have gone right past and it's the skulls thrown in his way that make him stop. Or as one might see it, the inevitability of death. Yorick's skull is never thrown, but has been set aside reverently on the edge of the grave since the very beginning. The Gravedigger has a history with its owner, and that fondness seems to extend to his remains. Of course, there's also a real world reason for it: This is Tchaikovsky's skull, bequeathed to the Royal Shakespeare Company after the great composer's death, so rather precious. Whether the audience registers it or not, for the actors, there's a difference. Not only is it a real human skull, but one that used to be a great man's, lending weight to the lines about Caesar and Alexander. Hamlet remembers who this object used to be, and is aghast, unable to reconcile the one with other. The way he balances it in his hands, makes it almost dance, it's like he's trying to inject Yorick's life and jolliness into it. Alas, it is a dead thing, and completes its metaphysical arc when he mimes using it to stop up a hole. Hamlet's relationship to these human remains evolves through the scene, from a slightly revolted nudge with his foot to holding Yorick's head in front of him, to eventually running off with it when the funeral procession arrives. It stays with him. Again, in the real world, it's so it doesn't get chucked away like the others, but in the world of the play, Hamlet's simply unable to let go, just as perhaps he isn't able to let go of his biological father (Yorick, a surrogate), and also a mirror of Laertes leaping into his sister's grave, another unbreakable bond between the living and the dead.